In between racing for balls and playing with my knitting, seeing if she can operate the sewing machine and relaxing whilst she enjoys her daily groom, Toile loves watching a bit of television. She especially likes wildlife, with either cats or monkeys, Countryfile when the cows come on, screeching birds are also a favourite and if a cat comes on that is purring she is most comical. But she will also lay across my chest and settle in for my evening viewing of Emmerdale and whatever cookery or crafting programmes happen to be on. Today I was channel hoping whilst having a coffee, Toile was in the mood to watch the T.V. 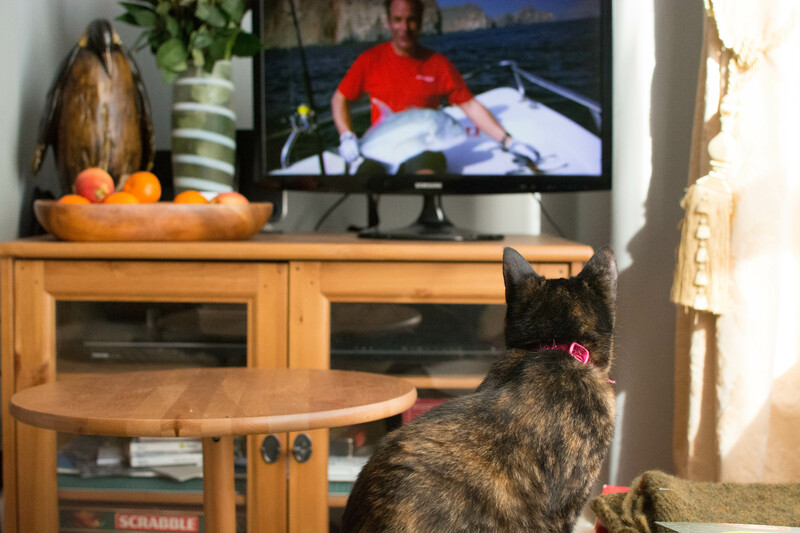 so we let her watch a fishing programme for a while, she seemed to enjoy it.